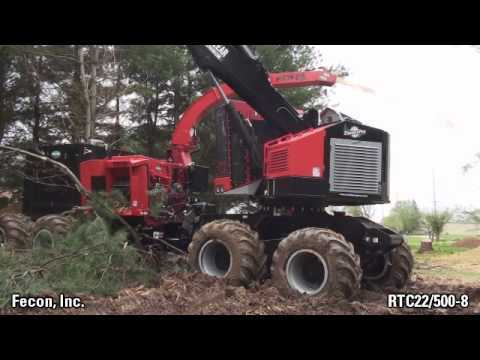 The Fecon® FCM 22, available in 365 or 500 hp, is a purpose built, completely customizable chipper module that can be mounted on a wide variety of on- or off-road carriers. 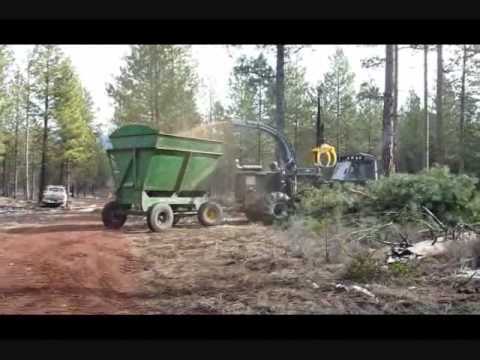 Contractors can lower costs (using less total equipment) and increase productivity with Fecon’s FCM22 chipper module. The machine is perfect for roadside chipping or extreme conditions chipping with standard remote control operation. Whether mounted to a forwarder or trailer, the machine is perfectly suited for delivering chips for biomass, broadcasting or hauling away. The FCM22 is a 22” capacity chipping module that can be customized to fit almost any chipping operation for in and out of the woods. With features like load sensing hydraulics, PT Tech Hydraulic Clutch, and an IQAN Electrical System, the FCM22 has the best in chipping technology as standard equipment. With a variable speed infeed and Fecon’s Power Feed Management, the FCM22 has the ability to greatly vary chip sizing for different chip markets. There are many options in carriers and trailers for the FCM22. New and used log forwarders, tracked vehicles, log trailers, de-limber trailers, log trucks and flat bed trucks are all great carriers. Fecon® also offers complete turnkey mounting packages to get you chipping with your own unique chipping system. 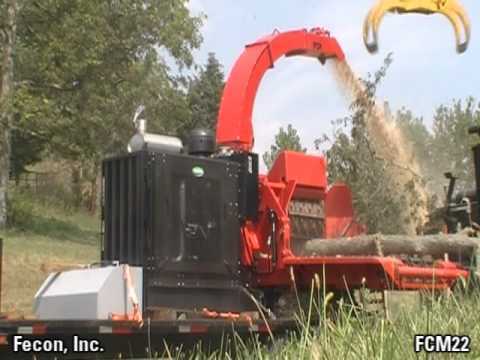 The power of our standard hydraulic infeed table with Power Feed Management, easily handles small branches and slash and occasional whole trees up to 22” in diameter. The optional Whole Tree infeed produces over 16,000 lbs. of limb crushing torque. With 365 horsepower and 500 horsepower options, the FCM’s versatility helps it fit in well on many different job sites. The discharge system has been specially designed to densely fill open top chip vans, as well as Fecon Chip Collection Wagons, making this a great machine for biomass chip collection. Easy Maintenance Access Fecon’s® RTC22 is a purpose built mobile chipping system like no other. This dedicated carrier is specifically designed for chipper weight, center of gravity, and serviceability. The high mobility of the RTC22 is welcomed on remote jobsites that could be hard to get to with other vehicles. Easily handles small branches and slash and whole trees up to 22” in diameter. Optional Whole Tree infeed produces over 16,000 lbs of limb crushing torque. Rubber-tired design is a great benefit to any roadside chipping operation. High travel speeds and reduced trimming needed with the extreme crushing capacity of Fecon’s Power Feed Management. Available on three different carrier models to help better customize to customers needs, the RTC22 comes in 4, 6, and 8 wheel models ranging from 148hp to 300hp.